What’s a side hustle? It’s a way of making money outside of your primary source of income. Side hustles are becoming increasingly popular as individuals look for ways to boost their earning potential. While a side hustle can sometimes be a “part-time job,” the wise hustler seeks opportunities for growth and financial freedom. Rent out an extra room on Airbnb. Make money as a driver. Sell your stuff. Then sell other people’s stuff. Launch a coaching practice or consulting agency. Side hustle ideas that don’t require specialized skill. Side hustle ideas that leverage skills. Side hustles that don’t require specialized skills are often easier to get started but usually have lower income potential. They are great for when you need additional money and are looking at a short-term horizon. These gigs offer little to no leverage or growth opportunity (most of the time). Examples of these side hustles include driving for Uber or tutoring. Side hustles that leverage skills are suited for those who already possess the necessary skills or are willing to invest in learning them. These gigs tend to have higher earning potential and opportunities for growth. They can also evolve into full-time work or entrepreneurial ventures. The best side hustle ideas provide more than just additional income; they support your professional development. These side hustles help you enhance your skills and increase your marketability. Join over 640,000 hosts who are renting out their homes, apartments, and rooms to over 150 million users on Airbnb. Do you have a car in an urban environment? Drive for Lyft or Uber. Deliver for services like UberEATS or PostMates. Sign up at TaskRabbit and help people move, build furniture, clean, and do other stuff around the house. Need to make quick cash to pay off your credit cards? Cleanse your home of everything you don’t need and sell it on eBay or Amazon. Books, collectibles, whatever. If you get proficient at it, you can create a service selling other people’s stuff for a commission. Do you have old cell phones laying around? Sell them on Gazelle. Do you have a hobby of making a craft like stationary, metalwork or jewelry? Join over 1.9 million sellers and open up an online storefront on Etsy. Become a virtual assistant for services like BELAY and Fancy Hands. Grow a tutoring business using services like WyzAnt or VIPKID. Or create content for educators at Teachers Pay Teachers. Do you have graphic design skills that businesses and others might need? Enter the talent pool on sites like Fiverr and 99Designs. If you have skills in programming, writing, designing, translating, selling, marketing, law, or finance, you can tap into the many freelance marketplaces online like Upwork and Guru. 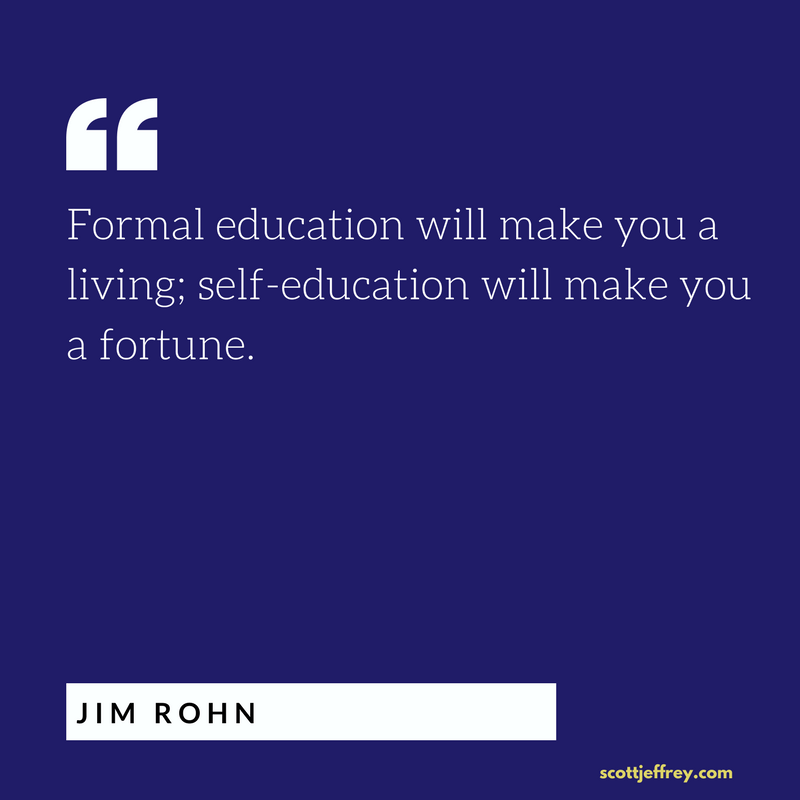 If you have specialized knowledge that others want to learn, you can create a course and sell it on learning platforms like Teachable and Udemy. This side hustle is significantly more difficult than most people realize. Only about 9% of bloggers earn between $1k to $10k per month, and less than 4% make over $10k month. And with only a few exceptions, these profitable bloggers started over ten years ago. That said, there are many different ways to make money blogging including affiliate commissions, digital advertising, and selling your products and services. If you have specialized knowledge and a desire to share it, you can enter the “thought leadership” space with blogging, podcasting, and publishing (print and digital). This side hustle combines with many others and requires a wide range of skills and discipline to make it profitable. While it might take minimal skill to start an e-commerce business using a platform like Shopify and WooCommerce, it takes some experience to market your website and drive qualified traffic that converts to sales. This can be the most lucrative side hustle with the potential of turning it into a full-time business. I recently met three different entrepreneurs with Amazon Reseller businesses. Two of them just sold their businesses for over $20 million and the third was on pace to do the same. Pick up the Jungle Scout Chrome App and starting researching opportunities. For in-depth training on how to become a successful Amazon Reseller, check out the Amazing Selling Machine training course. If you possess marketing skills or are willing to invest the time to learn, you can create a specialized website that attracts a specific type of reader or customer (e.g., car enthusiasts, musicians, or outdoor adventurers). This website can include product reviews (with affiliate partners), product comparisons, and editorials. If you attract a big audience, you can also generate income with digital advertising, lucrative sponsors, and drop-shipping e-commerce. There are over 50,000 life coaches worldwide and even more business coaches. You can get coach training through an organization like the International Coaching Federation. And if you have expertise that other business owners want, you can start a private consulting practice. Your available time is finite. When you’re saying “yes” to one thing, you’re saying “no” to many other things. In what areas can you add the most value to others? What skills are you willing to develop? Which side hustles are most interesting to you? What side hustle ideas seem the most lucrative to you? Are their side hustles aligned with a full-time business you’d like to develop? If you evaluate your options with a long-term horizon, say five years out, you’re more likely to make a decision based on your Future Self. Any profitable side hustle will involve a learning curve. Not only are there things to learn (which you may already know), but you also need to develop certain marketing skills. Each of these steps requires numerous skills that come through practice and experimentation. Okay, now let’s get practical. 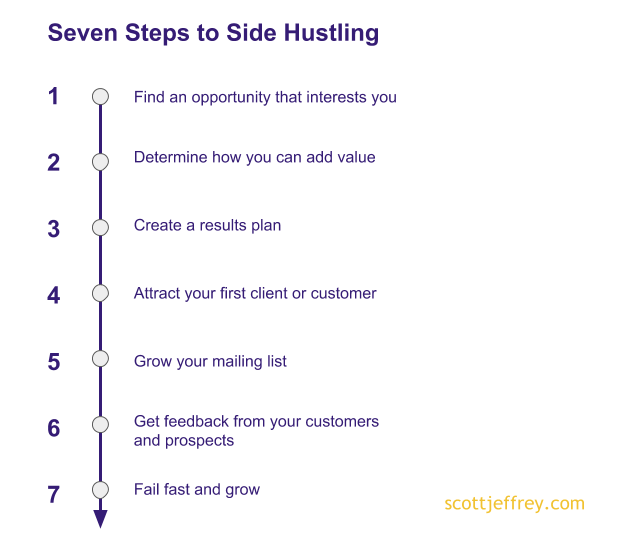 Most of the best side hustle ideas follow a similar sequence to begin earning extra money. You might already know what that is. If not, test out lots of stuff and see what sticks. Try to find a topic people are actively searching for help with, and one that you can help them solve. What skills do you possess that others don’t have and for which they are willing to pay? What skills can you turn into services? What knowledge do you have that others want? This plan can be simple. You can start with a short-term financial goal and a time frame. Then, determine what has to happen to achieve your goal. What do you need to learn? What actions must you take? Many people develop traction with their side hustles by leveraging their existing network. Offer your services on Facebook, for example. Who do you know? These people might become clients, or they may refer you to people within their network. When you’re first starting out, consider offering your service for free. Produce results for these initial clients and then get testimonials and referrals from them. Talk to virtually anyone who sells information, products, or services online in any form, and they’ll tell you how important it is to grow your email list. You can’t start building your list too soon. Start now—even if you don’t have a product or service to sell. Feedback is the key to product innovation and marketing. Customer feedback will provide you with clues on how to improve and when you need to pivot in new directions. The easiest way to get feedback is to ask your customers directly. If you can do this one-on-one, great. If not, send out an online survey. When you’re first starting out with your side hustle, you might think that other people have it all figured out. The reality is that anyone successful, in any area, failed far more than they succeeded. We’re all making this up as we go along. You’ll need to test out many different ideas, strategies, and tactics before you find stuff that works or makes improvements. The question isn’t whether you’re failing, but if failing fast enough. Evaluate these side hustle ideas and then leverage them to make progress on your path to financial freedom!